Tim Cook this weekend gave a commencement speech to the 2015 graduating class of George Washington University, sharing a number of reflections and his perspective on life for graduating students and their families. As announced in February, Cook was asked to speak at the event in Washington, DC following a nomination process by students earlier in the year. Cook started off the 20-minute speech by reflecting on a few moments from his teenage years in which he met both President Jimmy Carter, one of his personal heroes, and Alabama Governor George Wallace, a man he disagreed with vehemently even at the young age of 16. The two men's similar backgrounds - they were both from the South and Democrats - helped teach Cook about how his internal journey in life was just as important as his external passage through schools, universities, and jobs. My own journey in life was just beginning. I hadn't even applied to college yet at that point. For you graduates, the process of discovering yourself, of inventing yourself, of reinventing yourself is about to begin in earnest. It's about finding your values and committing to live by them. You have to find your North Star. And that means choices. Some are easy. Some are hard. And some will make you question everything. Twenty years after my visit to Washington, I met someone who made me question everything. Who upended all my assumptions in the very best way. That was Steve Jobs. Cook mentioned that just like Apple in the late nineties he was also "rudderless" and looked to Jobs' invitation to join the company and "change the world" not as a skeptic but as a believer. As expected, Cook looked back on the decision as one of his best and encouraged the graduates of George Washington to "find your North Star." The Apple CEO concluded his address at the university by taking a picture of the amassed crowd of graduates, claiming his position at the podium was "the best view in the world." MacRumors reader Andras Szep was on hand for the event, sharing a few photos and noting he was lucky enough to find a seat up front for Cook's speech and get a few moments afterwards to speak briefly with the Apple CEO, congratulating him on his speech and shaking his hand. It's crazy how shaking a guys hand is a big deal in this life. He's just a man. No way I'd waste my time photographing me standing next to a CEO of any company. Some men aren't just men to everyone... My dad might just be a man to you but a role model to me. Tim Cook might just be a man to you but a person of inspiration to someone else. I personally came from a family that had nothing and it has resulted in people like Larry Ellison and Howard Schultz, both of which came from nothing too, to be role models to me. To me, they are proof that if I continue doing what I've been doing and I have a little luck there is no reason I can't be as big as they are. Nothing wrong with looking up to someone. Personally I think its time for Tim to stand on his own merits without having to always insert a Steve. He certainly has enough of his own accomplishments. 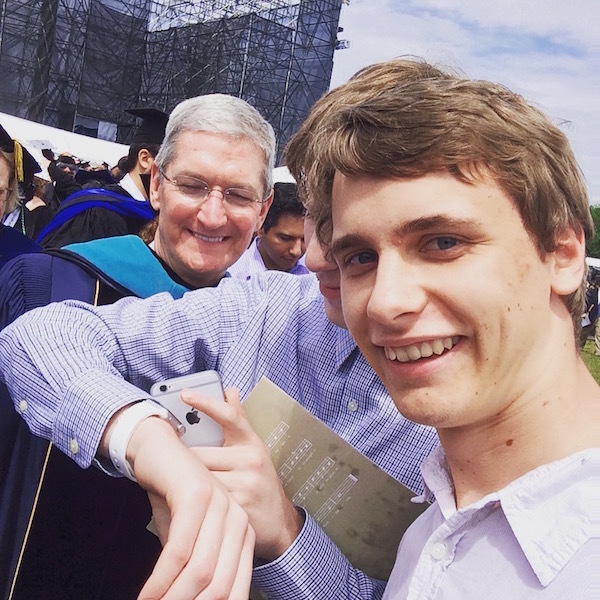 I think it is fantastic that they found someone at the commencement that has received his watch delivery. Good going, apple! Not everyone you look up to has to be someone you know personally. Some people wouldn't waste their time posting on MacRumors, yet you and I are both happy to do that. People are all different and it's one their great strengths.